A member of MUCA, Juan Chinchilla was disappeared last night close to Tocoa (see the communique below). Juan made phone calls to friends before he was disappeared, saying that he was being followed. Later his motorcycle was found with two bullet holes on the road. I spoke with Joni Rivas from MUCA, who says that they have not heard anything from him and he has NOT APPEARED. They hope he "turns up alive and is not being tortured." Juan is a JOURNALIST in charge of the media relations for MUCA. He has participated in the majority of the negotiations and meetings in Tegucigalpa that MUCA had/has with government. He is in charge of the MUCA blog and normally is the person that sends out info, communiques and photos from the region. He is well known within the resistance and campesinos movements as well as to the authorities. Last year (I can't remember exactly, maybe July/August), he was detained and held over night in Copan for not wearing his seat belt. He is high profile, well known and a target of the police and military. Tocoa is still heavily militarized. Campesinos continue being threatened by police/miltiary/private security forces the last two incidents that I know of occurred last Tuesday (harassing MCA member on side of road close to Guadalupe) and January 2 when two youth/campesinos were brutally beaten. Please call the police stations and the DNIC in Tocoa & Trujillo and ask about Juan Chinchilla's whereabouts and what they are doing to investigate his disappearance. Mention that you are concerned for his life. 3) Police station, Trujillo, 011-504-2434-4038 (try this number last as I have been unable to get through to this one). An English translation of the communiqué from the FNRP, and the original communiqué in Spanish is below. We demand Juan Chinchilla be returned alive! maintain a state of savage repression again the people of the Aguan valley. fired but when others arrived, they found only his motorcycle with bullet holes in it. for the re-founding of Honduras. We Will Resist and Succeed! ¡Exigimos la aparición con vida de Juan Chinchilla! 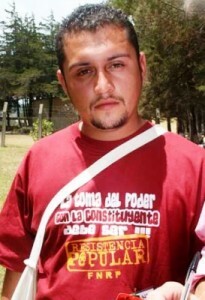 El sábado 8 de enero fue secuestrado el compañero Juan Chinchilla, miembro del Comité Ejecutivo del Frente Nacional de Resistencia Popular, como representante de las Juventudes en Resistencia y el Movimiento Unificado Campesino del Aguán (MUCA). Juan se ha destacado por su beligerancia en la lucha por el derecho de los y las campesinos a trabajar la tierra, lo que le significó un permanente hostigamiento y amenazas por parte de los grandes terratenientes de la zona, Miguel Facussé, René Morales y Reinaldo Canales, quienes con la colaboración del régimen de facto de Porfirio Lobo, mantienen una represión salvaje contra la población del valle del Aguán. El secuestro se dio a las 8:00 de la noche del sábado 8 de enero, en el desvío al asentamiento campesino La Concepción, en el municipio de Tocoa, cuando Juan se dirigía hacia su casa. Momentos antes de ser secuestrado, él llamó por teléfono para denunciar que una moto y un carro lo estaban siguiendo. Después se escucharon disparos, pero cuando las personas llegaron, sólo encontraron su moto con dos impactos de bala. Condenamos vehementemente este hecho. Exigimos el respeto a la vida y la integridad física de nuestro compañero que ha demostrado un extraordinario valor en la lucha por la refundación de Honduras. Alertamos a las organizaciones de derechos humanos nacionales e internacionales para hacer presión sobre este régimen represor que habla una falsa reconciliación y unidad nacional, mientras continúa avalando y participando en crímenes contra personas y organizaciones populares. El FNRP establecerá de inmediato, acciones de presión para lograr la liberación de Juan Chinchilla.